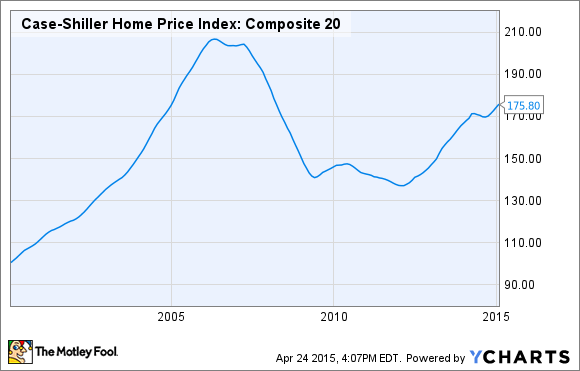 The housing market has recovered nicely during the past few years, and may continue to do so. How can investors profit from it? The housing market in the U.S. is finally starting to show signs of returning to normalcy, and looks healthier than it has in years. Which stocks could benefit the most if the housing recovery continues? Even though home prices have increased dramatically during the past few years in many markets, there's reason to believe the housing recovery is far from over. For starters, the market is simply looking healthier than it has in a long time. For much of the early and mid-2000s, we saw double-digit annual home-price gains and unsustainable speculation. Then, when the bubble burst, we saw several years of sharp declines followed a few years later by an almost equally rapid rebound. In a healthy real estate market, home prices should increase slowly and steadily -- barely faster than the rate of inflation. And this kind of stability is what we are starting to see once again. According to Zillow, home prices are expected to increase by 3.8% in 2015, and another 3.3% in 2016. This is the kind of growth that is healthy and sustainable. Additionally, there are several new mortgage programs designed to make it easier for first-time buyers to get a mortgage, such as the new 3% down conventional options from Fannie Mae and Freddie Mac. First timers have historically made up about 40% of the market, but currently make up just 33%. If this group comes back to the market, it could stimulate a high level of activity, and keep the recovery alive. Homebuilders will obviously benefit if the housing recovery continues, and my personal favorite right now is D.R. Horton (NYSE:DHI). D.R. Horton has been the top U.S. homebuilder for 13 consecutive years in terms of the amount of homes closed, and sells homes in 27 states in a wide variety of price ranges. The company has produced some pretty impressive growth lately, with net sales up by 30% year over year, and a 21% increase in the backlog, which currently stands at more than 12,000 homes. Analysts tend to agree that the growth will continue, and are expecting earnings to rise by a total of 46% by the end of 2016, a pretty impressive earnings growth rate for a stock that trades for 16.9 times TTM earnings. In its latest investor presentation, D.R. Horton says its current land ownership supports double-digit earnings growth for the foreseeable future. This stock could produce some strong returns during the coming years if home sales continue to grow. Another way to play increasing activity in the housing market is with a home-improvement retailer, and Lowe's (NYSE:LOW), in particular, is looking rather enticing right now. Lowe's has an ambitious growth strategy for the next few years, which includes aggressive expansion into Canada and Australia, as well as some underserved -- but potentially lucrative -- U.S. markets such as New York City. The plans call for 30 new stores annually between now and 2017, as well as $400 million toward renovations of existing stores, and $350 million per year in IT investments. In addition, Lowe's is concentrating more of its efforts on the professional home-improvement market -- contractors and builders -- which make up nearly half of the market, but only account for 30% of the company's sales. Management believes this will increase the company's return on invested capital, or ROIC, from 14% to 19%, which it expects will nearly double the EPS from $2.70 in 2014 to $4.70 in 2017, an 18.5% annual average growth rate. While Lowe's may look expensive at 27.1 times earnings, it's reasonably priced, if not cheap, considering the expected growth. A less obvious play on the housing recovery is banks, particularly those with large mortgage operations like Wells Fargo (NYSE:WFC). Wells Fargo can benefit in two big ways from the continued housing recovery. For one thing, the bank will produce more income from mortgage originations. In the most recent quarter, Wells received $93 billion in mortgage applications and originated $49 billion in mortgages, up from $66 billion and $44 billion, respectively, in the same quarter last year. There's an application pipeline of $44 billion heading into the busiest time of the year for housing; so I'm definitely curious to see how these numbers look for the second and third quarters. In addition to originations, mortgage delinquencies tend to drop as home prices rise. Rising prices mean that fewer borrowers will be underwater on their mortgages, and will have an easier time selling their homes when they need to rather than defaulting on the loans. Wells Fargo has a $1.7 trillion portfolio of residential mortgages it services, and the value of nonperforming first-lien residential real estate loans has fallen from $8.8 billion to $8.3 billion during the past six months. Wells Fargo is an excellent all-around bank with fantastic asset quality and strong growth. The prospect of a continuing housing recovery is just one more reason to love the stock. Of course, nothing is certain in investing, and it is important to know the risks before buying any stock. In this case, there are a few things that could derail the housing recovery and prevent these companies from delivering strong results. For example, if interest rates spike quickly, mortgages will become less affordable, and fewer people will buy homes. And if the stock market drops rapidly, it could make consumers nervous, and they might delay big purchases, such as buying a house. However, with these three stocks, I believe that the reward potential greatly outweighs the risk, and all signs point to a healthier housing market and continuing recovery.